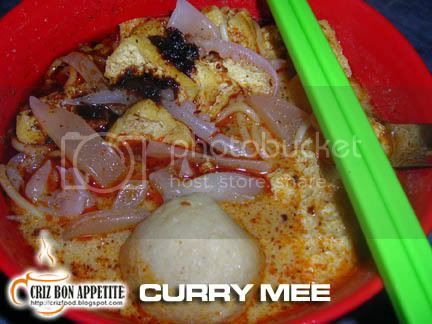 There are also many different versions for the Curry Mee of Penang. You get the salty, sweet, salty sweet, spicy with lemon grass or chicken curry. Some would be cooked with thick creamy coconut milk, evaporated milk, full cream milk whereas some could be of almost clear soup type. Some stalls would also have an array of curry chicken, chicken legs, fish/meat balls, chicken intestines, squids, cuttlefishes, clams, tofu balls, prawns, pig blood gelatin, processed pork skin, long beans, etc for customers to choose. 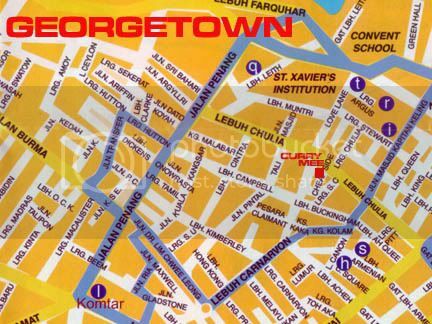 The one I went to was located along Chulia Street. The crowds there were usually big and waiting for a bowl of noodle would take up to half an hour or more. The Curry Mee soup is not like those selling elsewhere. It has the taste of some curry spices and comes with a big fish ball, garnished with lots of tofu balls, cuttlefishes, clams and pig blood served with a spoonful of fragrant chilly paste. We ordered four bowls and they cost us on RM10.00. Do try this stall out when you are along town area. The Wan Than Mee and Apom stalls there are just as good. The location of the stall is very prominent. 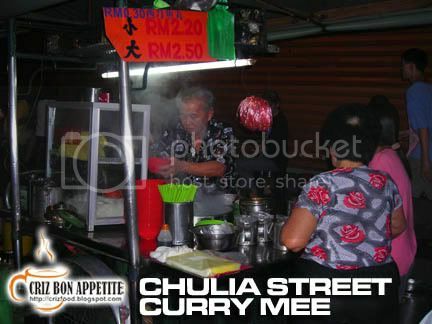 As you move along Chulia Street towards Weld Quay, you would see lots of hawker stalls on your right. The stall is just right in front of a furniture shop. Next to it is the famous Wan Than Mee stall. Address: Lebuh Chulia, Penang, Malaysia. Oh this curry mee that made me had stomach upset after eating it. But it’s one of the best curry mee in Penang. but hor… waiting time very long…. and a lot of time the autie will forget ur order or forget the sequence…..